Sister Louise of Mercy was born 1644 Louise de la Valliere in Tours, France. At the age of sixteen, her mother, the widow of the Duke of Orleans, moved with her children to the Luxembourg Palace in Paris. 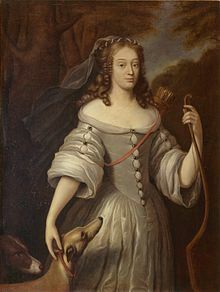 Louise was chosen to serve the young Princess Henrietta Anne of England, sister of Charles II and new bride of Philip I, who was the brother of King Louis XIV and the new Duke of Orleans. Princess Henrietta was quite attractive and rumors began to fly as the young Louis XIV seemed to enjoy her company, so she arranged for her pretty young maid of honor to meet him. This began an affair that lasted for seven years and produced five children, of whom two survived to adult life. But Louise was never at peace with the humiliating conditions of her life, especially when the King took a second mistress and forced his two mistresses to live in the same quarters, to appear together with him in public, and to ride with him and the Queen in his carriage. Although he had granted her the title of Duchess and legitimized her children, Louise, who had always been a pious woman and did not care for wealth or titles, attempted to escape to a nearby convent, but the King made her return to his court where the thunderous Lenten sermons of Bishop Bossuet, condemning court immorality, the court gossip as both the Queen and the King's new mistress gave birth, the secret births and loss of her own children, the humiliation of the Spanish Queen Maria Theresa, and her own conscience eventually led her to seek the counsel of a holy layman who directed her to the new Carmelite convent at Rue St. Jacques near the Palace, taking the name Sr. Louise of Mercy. A year later, she received the black veil from the Queen herself, of whom she had asked forgiveness. She died in 1710. It is said that King Louis XIV, whom she genuinely loved and prayed for each day of her life as a nun, died with a Hail Mary on his lips. 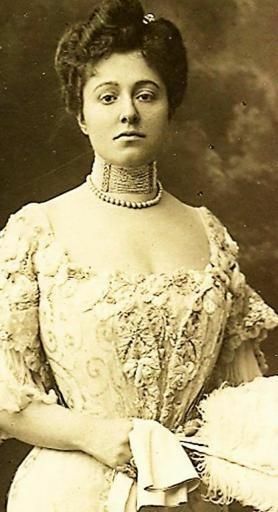 Alessandra di Rudini was born in 1876 to a Sicilian aristocratic family. Her father, the marquis di Rudini, was the mayor of Palermo at the age of 25. He helped to organize the campaigns of Garibaldi during the revolutionary days of Victor Emmanuel II, with open hostility toward the Church. Her mother, Marie de Barral, was a gentle women who did not share her husband's revolutionary ideas. She had one older brother named Carlo. Even during her turbulent childhood, Alessandra showed signs of a potentially great soul. She resembled her father in her intelligence and her rebellious spirit, with a passion for reading and for horsemanship, at which she excelled. Sent to a conservative Catholic boarding school, Alessandra proved to be disruptive and difficult, and was sent home after one year. Her father then sent her at the age of thirteen to a more liberal Catholic school, where she thrived and proved to be an excellent student, but an atheistic teacher there influenced her latent struggles with faith. Returning home at the age of sixteen, Alessandra assumed the role of mistress of the house, as her mother's illness forced her to reside in a nursing home. Her father, proud of his daughter's intelligence and beauty, introduced her to politics and to his circle of wealthy ruling class people. There seem to be two prevailing movements during this period of her life: her deep and sincere struggle with her faith, and her increasing assimilation to the expectations of family and friends. At eighteen, she married the marquis di Riparbella, Marcella Carlotti da Garda, ten years older than she, who died of tuberculosis, refusing any aid from the Church and leaving his young wife a widow with two children at the age of 24. During her husband's illness, Alessandra showed signs of a latent faith in her mission to revive that of her husband, but was apparently unsuccessful. After his death, she wrote to Bishop Serenelli of Verona, "I feel profoundly the lack of an ideal; it is an emptiness in my life that nothing can fill, no amusement, no folly, no occupation. What difference does it make if I have health, a large fortune, or a name, if I am hateful to myself? You who have dedicated your life to relieve so many miseries, believe that mine, though secret and hidden behind an impassive face, is nevertheless not among the least of them." She kept up a passionate reading of theological and biblical criticism marked by a rationalistic spirit, which only aggravated her doubts, although during this period she often prayed to God asking for the gift of faith. In the spring of 1903, Alessandra met the notorious Gabriele d"Annunzio, considered the greatest poet in Italy. Despite her natural dislike for him and her effort to resist, she fell under his spell and moved into his villa, abandoning her children and Christian friends. The affair proved disastrous. After only one year and a serious illness requiring three operations, she was thrown over by the unfaithful D'Annunzio. She returned to her home at La Garda, and eventually, at the suggestion of the tutor of her two sons, Father Gorel, made a trip to Lourdes. It was here that her innate skepticism was finally overcome. This pilgrimage, after years of painful searching, sickness, and rejection, proved to be the place where Alessandra finally discovered the healing power of faith. It was not long before she had entered the Carmel of Paray-le-Monial, the town in France made famous by the apparitions of the Sacred Heart to St. Margaret Mary, after asking forgiveness at the parish of Garda for the scandals she had caused.